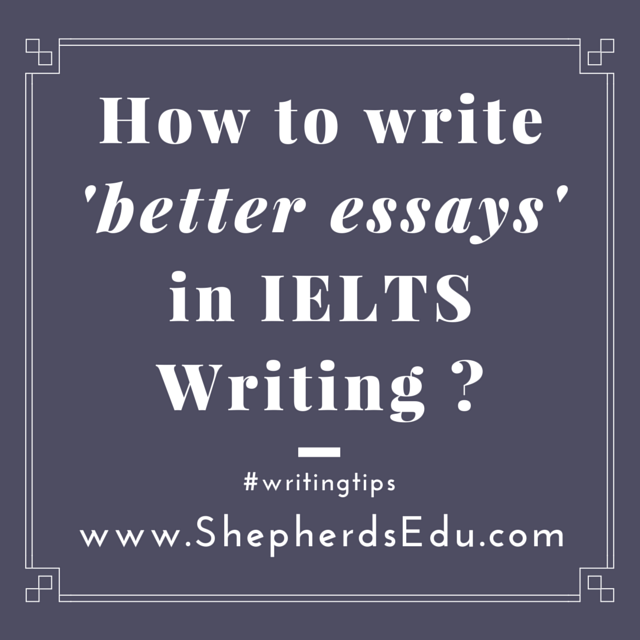 How to write better essays in IELTS Writing Test 2 ? WRITING IS an important element of learning any language and a very important section in IELTS. It is an important factor to determine control over the language. Writing comprises of various formats like letters, essays, articles etc that help one to develop a good command over a language. Writing skills can be polished and refined by practicing over it. So in this article we shall be discussing some problems that come into scene while writing anything with respect to a language. In the following paragraphs lets focus on the problems that our students encountered while they were writing an IELTS Writing Test 2 or the essay or when they were asked to write one. It depends on individual to individual what problem they face during an essay writing. But primarily in this article we would be discussing the hurdles students normally face while accomplishing the task. First and foremost problem that they face is hesitation. This problem was because they had not written anything over a long period of time so when asked to write an essay in English people get surrounded by a whirlpool of hesitation and awkwardness. As this hesitation took over them and they tend to become blank and are unable to accomplish what was told. It takes a day or so to come out of the awkwardness and they are able to start-up with the essay in IELTS Writing Test 2 quite easily. After overcoming the situation another hassle that they face is lack of content for a given topic. It is normally faced by almost everybody who has lost a touch with the language for many years. Another group of people having this problem are the ones who do not socialize much or are not interested in the world around them. Most fall in the former category as due to indulging in their specialized fields people lose a grip over the language. So they are so short of content in every topic that they are supposed to write an essay on. So there’s nothing to worry about if someone has the same problem because it can be solved. According to us students solve it by continuous practice of writing not only essays but other things like diary writing or writing our views over any random thing. So a little out-of-the-way effort can help anybody to solve this problem. The next problem that people face during this is content exhaustion that means after a certain time people are not able to create content and is sometimes really disheartening experience for them as this is one thing that they never thought they would encounter sometimes in their lives. But just crying over the problem is just not enough you have to work over it . Students start with collecting data points to overcome these or collecting points that are relevant to the topic and writing them over a paper and then creating ideas over the same. It proves quite beneficial in developing content and in this manner people are able to solve the problem. Furthermore, next hurdle in front is the use of a good vocabulary to make our writing tasks stand out in an impressive manner . As mentioned earlier, people lose touch with the language over long period of time so they lack in vocab and when they could create content found to be simple in terms of vocabulary and use of few good and impressive words can make writing more impressive. Now for this people have to go through various newspapers and find words that they did not know or were very new to them and look up for them in the dictionary and write their meanings too. In this manner, people are able to learn new words and meanings further using it in writing. Hence , they are able to resolve this issue as well. Now the next problem that arise is confinement of your content. By saying this we mean that confining your words in the given word limit. This is something hard to acquire as when you overcome the above said issues your writing becomes very smooth and goes with a flow in the sense that we are able to write a lot. Well, in this case limiting your content within a set word limit becomes difficult. So what people can try is focusing on more important points rather than less important ones. In this way you’ll be able to focus on the points that are important in relation to the subject and limit your words in the given range. While writing an essay for IELTS Writing Test 2 some key factors should be kept in mind to score well in this module. they are coherence and cohesion which means the inter-linking of the ideas and transition from one idea into another should be well executed. Grammar is something that cannot be ignored as well as this is something that can fetch you good score and leaves a good impression but only when used in a correct way. The writing should be legible i.e. should be easy to read and understand. Spellings should be perfect as wrong spellings show a lost control over a language. All said and done, these are few problems that students face while writing an essay but these are solved very easily and mainly by practice. Few tips and tricks have also been mentioned that could add stars to essay writing. Keeping all in mind one can deliver a great piece of essay writing.